The food we had at the Raj of India was divine! This is a really popular place so you may have to wait for a table, but believe me it's worth it. The waiters were friendly and good at recommending dishes. Will definitely be going back to the Raj of India soon. Very surprised and disappointed with the Raj. Use to go here a lot with family and have a very nice meal, however just tried to order a take away over the phone and received the most appalling customer service. Will never go back here after this treatment. Not sure if its under new management but they've certainly lost mine and my friends and family's custom. I like the food here but I just tried to place an order for delivery and was told that it wouldn't be possible because the driver didn't feel like driving to where I lived. I've ordered takeaway from them before and there was never an issue about delivery on those occasions so I think this is really bad form. I wasn't offered a real explanation - they just kept saying that the driver didn't want to make the delivery. So I took my money and placed my takeaway order elsewhere. I won't be eating there again - they need a lesson in customer service. Or at least cover for their lazy and rude delivery people a bit better. Really, really disappointed with Raj of India. 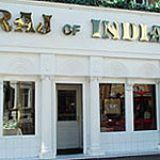 I have been going to the Raj of India for just under ten years and there is never anything but good and friendly service and excellent food. 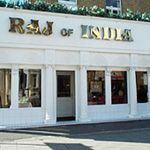 Raj of India had awesome food and very friendly staff. Love it. Quietly tucked away on Shepherds Bush Road, this little gem of a restaurant has been offering delicious Tandoori and Balti dishes and unrivalled service since 1996. This restaurant is squeaky clean with bright walls and comfortable furniture. Traditional Indian prints adorn the walls, but overall this restaurant has a modern feel, with bright and colourful chairs. Take a window seat if you like to watch the world go by. The atmosphere is very relaxed, due to the polite, friendly staff and the subtle hint of Indian music played throughout. This is an informal restaurant with very reasonable prices, and diners are made to feel very welcome. Vegetarians are catered for at the Raj of India, but the dishes that stand out the most are the ones that feature tender cuts of meat and delicate spices. Most main dishes are well under £10, with most starters and sides coming in at about £3. For a light starter, try the chicken tikka, which is lightly spiced and succulent. You can also sample the tasty prawn starter, which consists of a large juicy king prawn, which has been lightly coated in breadcrumbs. Fresh tasting and tender, this dish is ideal for those who require something light before their main course. The Balti vegetable masala is a great vegetarian main, with succulent vegetables cooked in a subtle mix of herbs and spices. This dish is served with an outstanding naan bread, which is slightly doughy and very moreish. Carnivores can opt for the lamb madras, which features good cuts of tasty meat in a thick, spicy sauce. If you have room, order a side of aloo gobi – delicately flavoured potato and cauliflower, and Bombay aloo – potatoes with a hint of spice. There is a wide variety of desserts, but the Fantastica ice cream is great – a vanilla and toffee dessert which is sweet and satisfying. 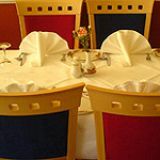 The restaurant serves a wide range of wine, beer and spirits, with a bottle of house wine costing £9.95. Try a traditonal Kingfisher beer, which is sharp and clean and a perfect partner to Indian food. If you have a sweet tooth, try a mango lassi, which is a type of sweet smoothie made with fresh mango. 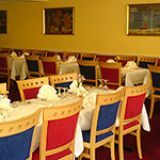 The food here is well-cooked and delicious – come to the Raj for good homemade dishes and exceptional service.